Retractable banner stands at Las Vegas Magic Convention are a very popular display graphic. These retractable banners stands ( also known as upright banner stands) are compact but yet provide for a very large graphic display, making them a very popular graphic at Magic. This year, the Magic Convention is being held at the Las Vegas Convention Center, 3150 Paradise Rd. Las Vegas Nevada 89109. There are expecting about 85,000 people to attend this years show, making it one of the biggest and best. Many signs and banners will be needed for these shows and many of these signs and banners will need to be made the same day or within 24 hours because of changes in marketing plans. However, often the signs and banners are needed because they shipping fails to deliver their graphics in time or they get received damaged and need replacing. The retractable banner stands are offered in different sizes to fit the room in your display booths at the Magic Convention. Wide retractable banner stands ( at around 5ft in width) are available and they can be as small as 2ft wide. Often, a company will take a very large graphic and cut it up into smaller sections and then apply the graphic to banner stands and then place the banner stands next to each other so as to simulate one large continuous graphic. This is commonly known as a banner wall in the sign business. 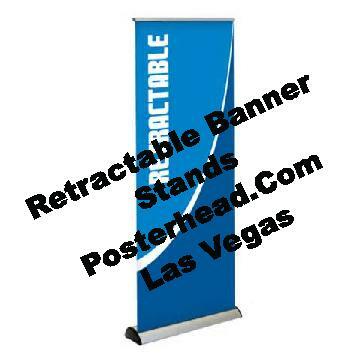 Retractable banner stands at Las Vegas Magic Convention are not expensive and can be purchased for under one hundred dollars in the popular 33″ wide by 78″ tall banner stand. Of course, larger banner stands are available but they do not cost more than $200.00. All these banner stands can be made the same day or within 24 hours on a rush order basis. Everybody attending the Magic Show in Vegas have a Great time.